Made in the U.S.A. 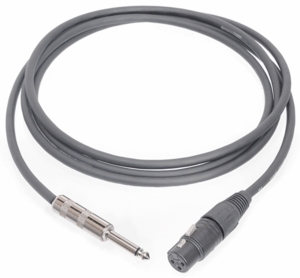 Same as our CMK-Series with a Neutrik�-Brand female XLR on the mic end, but with a 1/4" phone connector on the business end. Assembled in the U.S.A. with Neutrik�-Brand XLR terminations. These Microphone cables feature two heavy-duty 20AWG conductors and a dense braided shield for excellent noise rejection.